Summary: A teen-age boy is caught secretly videotaping females changing in the pool area of Idlewild Park. 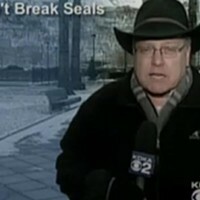 Station: WPXI Channel 11 Reporter: Timyka Artist, "Live" When It Aired: July 22 Running Time: 1 minute, 47 seconds Visuals: * Artist wielding the self-made contraption the teen used to spy on women. * Outside the grassy knolls of idyllic Idlewild Park. Highlights: * Artist's introduction" "The suspect, who is just 15 years old, was allegedly caught by one of the women that he was secretly videotaping. Now tonight, not only is the teen-ager out of a summer job, but he's also been charged with disorderly conduct and he's in big, big trouble with the authorities." * When Artist explains, "Thanks to advances in technology, nowadays cell phones can do a lot. But what a 15-year-old water-park employee is accused of doing is downright illegal, even disturbing to some." * When an older, female park-goer says, "I'm shocked. I really am." * When Artist exclaims, "Park goers like [this woman] and her daughter are outraged by what happened in the popular family amusement park last Wednesday ... The suspect allegedly did it by attaching his cell phone to a broom handle and then holding it up to the rafters, a crime [to] which he later admitted, according to police, and when they asked him why, the boy said he didn't know." * When Artist reports, "[This woman] says it's very unsettling for her and her family, but she [has] no plans to forego one of her favorite summertime activities," and the woman continues, "Um, I'll probably still go a lot, but I probably will be a lot more careful where I, you know, go to change for the swimming area and stuff like that." 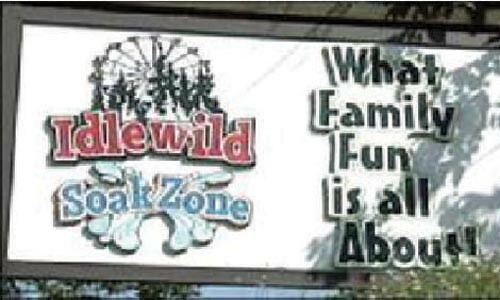 * When Artist ends, "Well, Idlewild representatives aren't saying much tonight, but they did release this brief statement earlier today, saying, quote, 'We did dismiss a team member for breaking park policy. All other questions should be directed to Ligonier police.'" What We Learned: Apparently, there is a difference between "BIG" trouble and "BIG BIG" trouble! Unanswered Question: Doesn't official outrage call for some kind of couch-burning? News Value: 2. This reporting is a tad over the top for an isolated incident, which I don't find surprising at all. What does continue to surprise me is the fact that employers don't write or enforce policies that pertain to cell-phone usage in the work place.